Take away the first 8:22 of Monday night’s game and the Bryant Lady Hornets freshman team played[more] almost even with the Lake Hamilton Junior Lady Wolves, only getting out-scored 23-21. Unfortunately, in that first 8:22, Lake Hamilton, led by former Bryant High School girls coach Blake Condley ran out to a 20-2 lead. 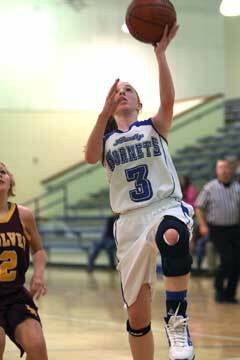 The result was a 43-23 victory as the Lady Hornets continued to struggle offensively. With Lake Hamilton dropping its full-court press and getting 17 players in the contest, however, Bryant was able to reach a season-high total of 23 points. 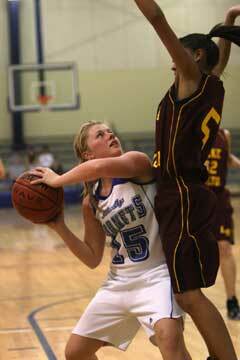 “I thought the first half we just lacked intensity,” said Lady Hornets coach Nathan Castaldi. “They got every loose ball, they got a bunch of second shots. We talk about making sure we control the things that we can control and playing with intensity and effort is one of those. The first half, we didn’t. The second half, we did a better job and we played them basically to a draw in the second half and we did that because of our intensity. The Lady Wolves forced 11 turnovers, often just muscling the ball out of the arms of the Lady Hornets, who managed just two shot attempts in the period. Lake Hamilton led 13-0 at the first break then 15-0 before Jayla Anderson got Bryant on the board with a driving jumper at the 4:59 mark of the second quarter. 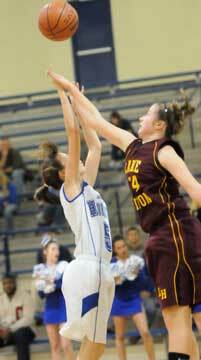 Consecutive baskets by Lake Hamilton’s K.K. 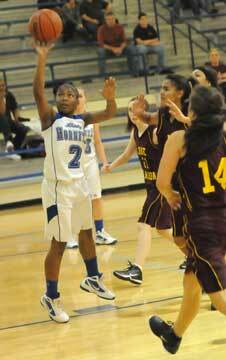 Nelson, one of three Lady Wolves that finished with 6 points to lead the team, made it 20-2. A free throw by Destiny Huffman and a 15-foot jumper by Niki Clay cut the lead to 20-5 but Lake Hamilton added a basket by Hailey Humphries and two free throws by Brandy Scott. Taylor Lindberg countered with a pair from the line for Bryant in the final seconds to make it 24-7 at the break. Huffman started the second half with a steal that led to a trip to the free-throw line where she converted once. After a Lake Hamilton free throw, Clay and Huffman knocked down consecutive jumpers off of drives to make it 26-12. But Lake Hamilton surged to its first 20-point margin, 32-12 and the Lady Hornets, despite a pair of jumpers by Mallory Curry and another by Huffman, couldn’t make much of a dent in the margin. A steal by Kierra Solinger that led to a layup by Clay had Bryant within 39-21 with 2:44 left but that was as close as the Lady Hornets would get. Clay finished with a game-high 8 points. Huffman added 6, Curry 4, Anderson 3 and Lindberg 2. 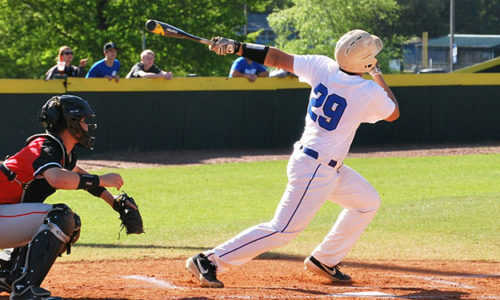 Bryant travels to play Conway White on Thursday. Nelson 3-7 0-0 6, Curtis 1-3 2-4 4, Kidd 0-2 0-0 0, Scott 2-5 2-2 6, Humphries 3-4 0-0 6, Crane 0-2 2-2 2, T.Gray 1-2 0-0 2, Murray 2-4 0-0 5, Sorrel 0-1 0-0 0, Sutton 2-5 1-2 5, Green 0-1 3-4 3, Bennett 0-1 0-0 0, Henson 1-3 0-0 2, Carpenter 1-2 0-0 2, Fuller 0-2 0-0 0, Williams 0-0 0-0 0, Roark 0-1 0-0 0. Totals 16-45 10-14 41. Clay 4-5 0-0 8, Anderson 1-4 1-2 3, Huffman 2-2 2-7 6, Davidson 0-0 0-0 0, Lindberg 0-0 2-2 2, Curry 2-3 0-0 4, Blair 0-2 0-1 0, J.Gray 0-0 0-0 0, Solinger 0-0 0-0 0, Barber 0-0 0-0 0, Earls 0-0 0-0 0, Powers 0-3 0-0 0, Jamison 0-0 0-0 0. Totals 9-19 5-12 23. 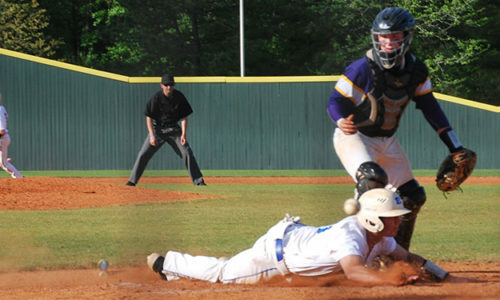 Three-point field goals: Bryant 0-1 (Blair 0-1), Lake Hamilton 1-3 (Murray 1-2, Nelson 0-1). Rebounds: Bryant 17 (Powers 4, Lindberg 3), Lake Hamilton 30 (Humphries, Henson 4). Turnovers: Bryant 23, Lake Hamilton 13. Total fouls: Bryant 11, Lake Hamilton 18. Fouled out: Lake Hamilton, Kidd.